Holidays are a great time to connect with families and friends! Because the holidays are a time to enjoy the wonderful foods and traditions that may only come about this time of the year, most families cherish the holidays and look forward to the day they arrive. However, for some parents, it can be a tremendous source of stress and anxiety because they are concerned about how all of these traditions and changes in routine will impact his/her child with autism. There may be gatherings related to a religious ritual or to getting family together because it is one of the handful of times everyone is able to make it work. The gathering may include foods or meals that might not be preferred, or even seen before, and may be very uncomfortable for some children with autism for sensory reasons (e.g., lots of lights, sounds, visual/decorations, even people in close quarters). 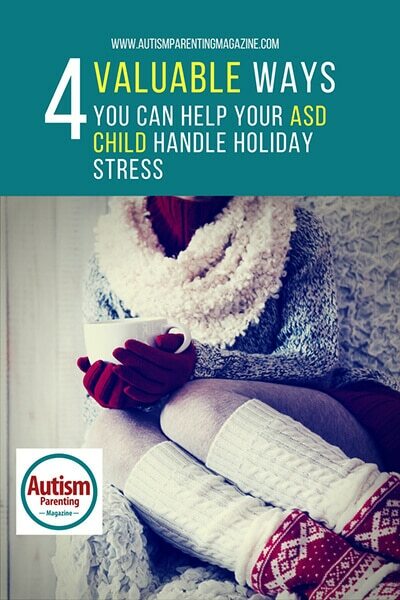 Depending on which holiday we are referring to, it can present with some unique challenges for families who have a child with autism. Here are some tips on ways you can prepare you and your family for the holidays that may help mitigate some of the anxiety and/or stress that you may experience. The first thing we need to do as parents before we can help our child is to identify where he/she may need some help. I recommend actually sitting down and making a list of the areas you think will be more challenging as they relate to the holidays. For example, at some family gatherings, it can take a long time to get everyone there organized and sitting at the table, or if it is a buffet, to get everyone ready to serve themselves. This can involve some waiting, and for some children with autism, this is very difficult to do. In this example a parent might write down difficulties with the wait times at an event. For another parent, it might be that there are always so many people in close quarters at a family event and his or her child may have difficulty tolerating all of the people, decorations, music/noises for extended periods of time. Once you have outlined the main areas of need, then you can decide where to begin for your unique child. It will depend on the skills that they already have and also on what you think is a priority. By writing it down you can also begin to track it so you can see when and where progress is being made. If you know ahead of time what will be happening at an event or gathering over the holidays (e.g., will there be a ceremony or is Santa coming) you can do things to practice and teach what they will be doing at that event. For example, will they be opening presents? If so, you can teach them about the social skills involved in doing this. You might teach them to take turns, which means waiting his/her turn. If it is appropriate, you could teach them to say ‘thank you.’ If your child with autism engages in challenging behavior, it is also a good idea to empower him/her with a voice or some way to communicate to you that they need something. In general, challenging behavior happens to fulfill a need, to get something that they want or need, or to get away from something that they dislike or find uncomfortable. It is very important to work on teaching them a better, more safe way to fulfill that need. If your child does not communicate with verbal language, then you would want to teach him/her to use a sign or an augmentative communication device to help them express what they need. For example, if your child finds noises and lights and close proximity to people for long periods of time uncomfortable, it would be so great if they could tell you that they need to find a quiet spot for a few minutes when they need it instead of hurting themselves or someone else. If your child is engaging in challenging behavior, then identifying why they are doing it is going to be critical because you would want to start teaching them a better way to get his/her needs met. A Board Certified Behavior Analyst (BCBA) can help you with this. I have written extensively on teaching children with autism all kinds of different skills. Read some more tips on how to prepare your child with autism for the holidays here. It all depends on the context but the key here is to help prepare your child with autism so that they can make the most of it but that they can also get help if they need it. Don’t be afraid to ask for help yourself, after all it is likely family and friends that you are going to be seeing so who better to ask? When you do ask, be specific about what you might need help with. For example, if you have a child with autism who is a flight risk, or who engages in bolting or wandering, you can ask for everyone to be vigilant around the exits. Or you may have a relative that your son or daughter really enjoy being around, you can ask them if they would spend a bit of time with them playing a video game or weather permitting, outside in the yard. Again, it will all depend on your unique circumstances, but people are generally willing to help. They just may not know how — give them a chance. Going to family gatherings or holiday events is not an everyday occurrence. Sometimes it is difficult to notice that there is progress being made because we are anxious or nervous about how it will go. Tracking how your child is doing on the skills you are working on allows you to see progress when it happens. Sometimes there are moments that happen that you would never have predicted. Make sure you notice those little moments of progress and celebrate them with your child. This is important because it gives you an opportunity to give feedback to your child (e.g., “Wow, you waited your turn at the buffet” or “I love how you asked for a quiet room when it was noisy”) but it also may make the holiday that much more enjoyable for you as the parent. You know your child better than anyone else. By preparing him/her for some of the more challenging scenarios that may pop up over the holidays you are hopefully going to be able to enjoy them more yourself and to see that your child is also creating positive memories associated with the holiday itself. Holiday time is certainly a time to become hyper-vigilant regarding your child’s sensitivities. They may show new signs or delayed signs of stress that you’ve never seen before. Developing a ritual that they can enjoy and finding ways to signal when they need to do something comforting and stress relieving is important too. For us, the most stressful time is putting all the festivities behind and reassuring our son that, like his birthday, the holidays will roll around again next year.